F Fernández-Beltrán, D García-Marzá, R Sanahuja Sanahuja, A Andrés Martínez, S Barberá Forcadell (2017): “Managing communication to for the promotion of Responsible Research and Innovation: a proposal of protocol proposal from discourse from the ethics”. Revista Latina de Comunicación Social, 72, pp. 1.040 a 1.062. Introduction: In little over a decade, Responsible Research and Innovation (RRI) has consolidated as a central focus of the European Union’s science and technology policies that can be tackled from the multidisciplinary perspective of ethics and communication. Methodology: The study proposes a communication protocol to favour RRI based on discourse ethics and the stakeholder theory. It analyses the current situation through surveys to the 70 Scientific Culture and Innovation Units of Spanish universities and research centres. The proposal was validated following consultations using four focus groups and two Delphi expert panels. Results and conclusions: Communication is morally essential to RRI management. The study proposes a communication protocol that allows moving towards a more responsible R&I aligned with the expectations of society. Communication; ethics; RRI; Responsible Research and Innovation; science communication. The Responsible Research and Innovation (RRI) is an emerging concept that has been acquiring an increasing weight in the European Union (ue). Since in 2001 the Marco Program incorporated the Action Plan on Science in Society in order to establish a common strategy to improve the connection between science and citizens, the RRI has acquired a more and more significant presence in the European convocations that define the lines to be funded regarding research and the current program Horizon 2020 incorporates it as a transversal action in any research process. The Rome Declaration about Responsible Research and Development in Europe (European Commission, 2014) issues a call to all European institutions, the States member of the EU and its organizations, companies and civil societies to establish RRI as central objective of all pertinent policies and activities. The development of RRI has led to the fact that, in a short time period, it currently impacts even the management and research mechanisms and quality control systems. Transparency, accountability, efficiency and productivity have turned into relevant objectives of the scientific policy marked by the European institutions. The European Commissioner of Research, Innovation and Science, Máire Geoghegan-Quin, stated in 2012 that never before has been so important to stablish a dialogue between science and the rest of the society before the need that progresses in science and innovation meet its needs and aspirations, reflecting its values and being responsible (Geoghegan-Quinn, 2012). The Declaration of Rome highlights how the early and continuous participation of all interested parties is essential for a sustainable, desirable and acceptable innovation, indicating that the excellence in the present goes beyond innovative discoveries: it includes openness, responsibility and the coproduction of knowledge (European Commission, 2014). From the research group in Management of Ethics and Business Social Responsibility (gerse), in collaboration with the Communication and Publications Service of the Universitat Jaume I, we have developed a study of approach to the phenomenon of RRI from the double disciplinary perspective of ethics and communication. On one hand, from the field of ethics the phenomenon has been analysed considering aspects such as responsibility, political framework, participation and citizens in order to progress towards an ethical framework of RRI. From this framework, an approach towards Responsible Research and Innovation was suggested from the field of communication, focusing in public communication of science understood in a broad sense. Besides the documentary study, the research included the completion of surveys by 41 Spanish universities and research centres about communication of science, two focus group with 30 representatives of the different interest groups of science and a Delphi panel that allowed gathering the contributions of nine experts in ethics, in communication and in rri. All these tasks were developed between June 2015 and December 2016. In the European field, the eu has marked both the development of the rri as well as its definition. The ue understands that rri makes a reference to the fact that society’s actors work together during the complete research and innovation process so to better aligned processes and its results with values, needs and expectations of the European society. To favour its implantation, it materializes its development around six axes: participation, gender equality, scientific education, open access to information, ethics and governance. (European Commission, 2012). Aligned with the ue, different authors that have talked about the definition of rri show some points in common about this emerging concept. Laroche (2011), Schomberg (2011, 2013), Carsten (2012, 2013) or Stilgoe (2013, 2014) emphasize the link of rri with acceptability and desirability of science and innovation, both in its processes and its results. The role of affected individuals and social actors is another repeated issue, as well as the need for their participation and interaction. Regarding communication, it is related to the need of transparency and openness. The documents that the eu has been elaborating regarding rri profile a normative framework of great interest when it comes to talk about this concept. In the case of the study developed by gerse, their analysis was focused in the participation and communication due to understanding that they were morally needed requirements to achieve a research and innovation that could be considered responsible. Even though the Charter of Fundamental Rights and the Treaty on European Union define the guidelines that establish the values and fundamentals of the eu and support the need to move forward towards responsible, transparent and participative research and innovation through aspects such as freedom of expression and the right for information, access to public documentation and participation of citizens in the democratic life of the Union, it is from the year 2000 when there appeared the first documents where we find the seed of current rri. It is the case of the report Science, Society and the citizens in Europe(European Commission, 2000), a document that has among its objectives to open a reflection about the relationship between science and society, activating a debate that will be concreted two years later with the Science and Society Action Plan(European Commission, 2002) which suggested 38 specific actions oriented towards the promotion of scientific education and culture in Europe, the elaboration of scientific policies closer to citizens and the incorporation of a responsible science in the different policies. Thus, we find three fields of action located on the basis of the rri phenomenon emergence, and where communication and participation play a key role. Afterwards, the project Monitoring Activities of Science in Society (masis) comprised the publication in 2009 (Sinue, 2009) a broad report about what has been called “science in society”, in order to contribute with a collective vision of trends and stablish the next strategy. Regarding communication, the document stablishes that its challenge for a science in society does not entail offering further information that much, but providing adequate forms for the dialogue instead (Sinue, 2009: 60). From the year 2011 when we find documents that reference in a specific manner the concept of rri, profiling its normative framework. The first report about rri (Sutcliffe, 2011) comprises a first approach to the concept, already offering guidelines related with its communication and participation of interest groups, referring in this sense to the need of involving stakeholders in the development of beneficial solutions for the common good (Sutcliffe, 2011: 8). Only one year after the ec publishes Responsible Research and Innovation. Europe’s ability to respond to societal challenges (European Commission, 2012),a very brief document that gathers the definition of the concept of rri by the eu and the six key aspects the development should be related to (participation, gender equality, scientific education, open access to information, ethics and good governance). The Group of Experts about the State of the Art in Europe regarding Responsible Research and Innovation (European Commission, 2013) explains the concept of rri as reference to “other forms to proceed in research and innovation that allow that those who initiate and are involved in the processes of research and innovation at an early stage: to get pertinent knowledge about the consequences of results of their actions and about the scope of options opened for them and effectively evaluate results as well as options in terms of moral values and use these considerations as functional requirements for the design and development of new researches, products and services. Besides, rri requires, in the opinion of the group of experts, that the research and innovation process is designed in such a way that allows the consideration of ethical aspects and the society’s needs. This entails an orientation towards participation of interested parties in these processes. More recently, we find in the current program Horizon 2020, the ue guidelines regarding the development of rri. Specifically, the Proposal for a Regulation of the European Parliament and of the Council that set forth Horizon 2020, explicitly indicates that this convocation shall favour an informed participation of citizens and the civil society in matters related with research and innovation. Therefore, it is outstanding the relevance of “education, access to scientific knowledge and elaboration of responsible research and innovation agendas that address expectations and concerns of citizens and the civil society” (Mesas, 2015). Likewise, the development of rri is promoted through the specific program “Science with and for the Society”. The development of rri requires a reflection about the ethical framework useful for stablishing a moral referent of action. If, as we have seen, rri is related with acceptability and desirability of the processes of science and its outcomes, as well as the participation of affected parties and interaction with them, the ethics of discourse proposed by the German philosopher Jürgen Habermas offers an ethical framework adjusted to the requirements of rri since they are based on the participation of all possible affected parties through a dialogic process. rri finds in the ethical theory of discourse, an ethical framework that sets an action landscape, a criterion of justice and validity, since it establishes a guideline, action or decision or an institution “that can be considered correct or fair whenever they find consensus of all affected parties, after a calculation of consequences, in a practical discourse in conditions of equality” (Habermas, 2000). This ethical framework allows granting a moral value to the management of a research and innovation wanting to be considered responsible, as long as the discourse complies with principles of honesty, inclusion, reciprocity and symmetry. The management of rri requires moving to the terrain of applied ethics, the ethical-discursive principle, favouring the practical development of this ethical framework. rri finds in the principle of discursive ethics a procedure to guarantee the impartiality of the moral judgement and a normative point of reference for the formation of will, both individual and collective, representing a correction criterion for the possible decision about justice of an action, rule or institution (García Marzá, 1992: 29). Therefore, from the application of discourse ethics, guidelines with moral validity can be complied with, finding an ethical orientation for action. The tools guide for rri developed through the European project rri Tools suggests the model of the dialogue, linked to this ethics perspective, as a successful model that allows involving interested parties (RRI Tools, 2016). Considering the development of a responsible research in the framework of discursive ethics, the philosopher Adela Cortina made reflections almost a quarter of a century ago about which are the ultimate purposes of research and who are legitimated for making decisions about these matters. Regarding the first issue, Cortina indicates that there is no purpose established beforehand, because “we give the purpose to ourselves” (Cortina, 1993: 258). Therefore, what is really relevant is the ethical subject of the decision. In this sense, the author understands that decisions in matters of science, technology and innovation cannot be left on the hands of rich countries, industries or politicians, but neither in the hands of experts because there are no experts in purposes: “they are experts in means, but the purposes only can be determined by the parties affected by the activation of a science, because they are who know best in what this good consists of” (Cortina, 1993: 260). The role of experts consists then in advising and the decision relies in the hands of the affected parties. To get to these decisions it is necessary to: achieve that experts communicate their researches to the society so that it can co-decide in an autonomous manner, having the necessary information available; making individuals gain awareness that they are the ones that should decide; and morally educating individuals in the responsibility when it comes to making decisions that may entail even the whole species. From the framework of the dialogic ethics, the management of rri is linked to the model of deliberative democracy as political framework, so that all political processes of decision, included those related to science and technology, must be submitted to the consideration of all affected parties. This, the critical perspective and the participation are constituted as core of democracy, so that the democratic principle is that everyone that may suffer consequences may have the capacity to decide (Habermas, 1998). This “ideal of participation” suggested in the discursive ethics and in the model of deliberative democracy require knowledge so that the different affected parties may take action in an autonomous and free manner. Therefore, it is worth deducing that in the case of science and innovation, affected parties require a knowledge enabling them for dialogue, and to achieve it, communication plays a fundamental role. As Cortina says, participation requires an active citizenship, and to achieve it, knowledge is needed, since “having reliable information available is mandatory to form a moral judgement, therefore experts willing to bring their knowledge and opinions to the sphere of public opinion is needed.” (Cortina, 2007: 256). The report about indicators for rri elaborated by the eu (European Commission, 2015) highlights how the social relevance and ethical acceptability of results of R+i are main themes in the promotion of rri policies. rri can find in the experience accumulated by the Corporate Social Responsibility (csr) a useful guide for its development, also from an ethical and communicative perspective. Again, as Cortina says, companies and organizations keep a moral contract with the society legitimating them and that obliges them to be, besides responsible, “responsive”, in the sense of giving response to the expectations of effected parties, therefore reaching a reciprocal acknowledgement (Cortina et al, 2005:15). From this proposal, the ethics of research centres would handle about the acquisition of the necessary character to respond to the legitimate expectations of parties affected by it in an excellent manner. Stilgoe, Owen and Macnaghten (2013) identify four dimensions that reflect a rri organization: anticipation, reflexivity, inclusion and response capacity. Both inclusion and response capacity are related with the need of incorporating expectations of possible affected parties and adequate to them, in a reflexive, anticipatory manner. “These dimensions reflect the organization’s capacity to involve interested parties, absorb their knowledge and learn from them” (Scholten and van der Duin, 2015) and, therefore, act in a responsible way before possible affected parties. Considering the ethical and political framework suggested for the development of rri, the model of csr developed by the School of Valencia based on discursive ethics and the theory of stakeholders, understanding these as “any group or individual that can affect or be affected by the achievement of objectives” of a company or organization (Freeman, 1984). Specifically, the csr of the School of Valencia is based on defining the responsibility from the dialogue of an organization with all its stakeholders trying to find out in said dialogue, which interests and values can become universal and therefore, legitimate. According to this proposal, an institution will be responsible when decisions, actions and policies adopted “may be accepted by all present and future affected and/or involved parties in an open dialogue in symmetric participation conditions” (García Marzá, 2006: 91). The csr model of the School of Valencia suggests the communication as principle from where to build politics of Social Responsibility of companies and organizations, a comparable role in the case of rri. In the framework of the proposal of the csr of the School of Valencia, Francisco Fernández Beltrán (2008) suggests a communicative model of csr by which the organization establishes a dialogue process to know legitimate aspirations and expectations of interest groups, negotiate public commitments that comply with them and inform about its level of fulfilment. Participation, dialogue, communication and transparency are key aspects in this proposal from where interesting contributions can be obtained to define a communicative model for the promotion of rri in universities. Likewise, the long theoretical and practical experience accumulated by csr has generated different tools for the management of social responsibility from companies and organizations, which usefulness shall be considered regarding the development of rri. It is the case, for example, of specific webs and publications, information channels for different publics, meetings and forums with stakeholders, ethic or behaviour codes, ethics committee, sustainability reports and ethics audit. - past, Public Appreciation of Science and Technology. The flow of information goes from science, the active disseminator and who controls the meaning of “the scientific” and “the non-scientific”, towards the public, which ends up being a passive information deposit. This lineal and unidirectional model has also been known as model of cognitive deficit or scientific alphabetization (Brossard and Lewenstein, 2010). - pest, Public Engagement with Science and Technology. This model transcends the notion of deficit because it conceives communication as a bidirectional flow between science and public. It emphasizes on the need to stablish mechanisms that favour the dialogue between science and society, therefore it is also known as the dialogue model (Brossard and Lewenstein, 2010; Miller, 2001). However, Alcíbar (2015) keeps attributing some problems to this model, because he considers it is still separating science and society, because even when it is intended to stablish a dialogue between them, it keeps the gravity centre in science, which it is conceived as a fix entity without fissures, the public must move to in order to get engaged with. –cusp, Critical Understanding of Science in Public. This model surpasses the two previous ones, since it critically considers all aspects that take part in science-society interactions, underlining the multidimensional and contextual character. It is about stablishing courses so that the public can achieve a critic understanding of the scientific phenomenon and, therefore, can question and respond to pros and cons the techno-science rises (Horst, 2008). In this model, also known as of deliberation (Horst y Michael, 2011), the knowledge and diffusion are still relevant but there is more emphasis on how this knowledge is socially used. The contextual model acknowledges that in reality individuals do not receive information as if they were empty containers, but instead they actively process it according to psychosocial schemes modelled by their own previous experiences, their personal circumstances and the cultural context they develop in. Even though it is about models and trends that entail different communication actions, they have coexisted over time and continue to do so now. We shall consider that the different ways of understanding the relationship between scientists and publics and communication of science can complement and enrich themselves, because without a communication of more informative character it is difficult to stablish a real and contextual dialogue. In this sense, the development of rri requires a PCST that considers the critical training of citizens as well as the establishment of a dialogue between science and society through the process, understanding science as an interactive part of society and considering that the forms of scientific and non-scientific knowledge have value. In the case of Spain, the development and professionalization of PCST has been promoted by the Spanish Foundation for Science and Technology (fecyt), depending on the government of Spain, through different initiatives among which the boosting since 2007 of the Scientific Culture and Innovation Units (ucc+i) is worth mentioning, constituted currently as a Network of ucc+i that in 2016 already grouped 70 universities and Spanish research centres (fecyt, 2016). As we will see, this Network of ucc+i has been a fundamental actor in the study, where a methodology based in an essentially qualitative perspective has been combined with the use of quantitative techniques. In a first phase, framed in the development of the doctoral dissertation Ethical aspects of communication of Responsible Research and Innovation (RRI) in the University (Sanahuja, 2016) a first study was performed about the state of the art from an ethical and communicative perspective, suggesting a first proposal of ethical model of communication for the development of RRI that was contrasted through two focus groups and one Delphi panel. In a second phase, developed through the project Study about the communication of Responsible Research and Innovation in ucc+i, funded by fecyt in 2016, a survey was done to the 70 research entities included in the ucc+i Network, two focus groups and one Delphi panel. The present article comprises a third phase of the study showing the results achieved in both phases and suggests a protocol of communication for rri from them and from the latest publications about rri, including indicators and tools for Responsible Research and Innovation established by the eu (European Commission, 2015; RRI Tools, 2016). Both the chosen methodologies as well as the sampling have enabled to trace an image of the current landscape of the public communication of science in Spain regarding rri, validate the communication model of rri developed and propose a protocol for its application. To know the situation of communication of science and the innovation in the Spanish field, as well as some aspects related to the ethical management, a survey to gather data and evaluations was designed, targeted to the professionals of the 70 Scientific Culture and Innovation Units from Spanish universities and Research Centres belonging to the ucc+i Network. The survey was elaborated with the Google Drive Tool and was distributed with the collaboration of fecyt, obtaining 41 responses, which comprises 58.5% of issued surveys and it is considered sufficient to show an image of the reality of PCST in Spain in relation to rri from the approach of the discourse ethics. Regarding focus groups, this technique of group discussion conducted by a moderator offered a means to gather information and points of view from different interest groups of the rri, diverse authors and the ue itself make reference to: companies, public administration or policy makers, civil society and scientific community (Carsten, 2013; Owen et al, 2012; European Commission, 2012). The focus group technique comprised a useful tool to analyse and confront information, helping understand the attitude of participants, and their perception of an intervention, which wouldn’t be possible starting from an individual basis. The group situation allowed us, moreover, to obtain different points of view and perceptions stimulated by interaction. For the development of the focus group, of one hour and a half duration each, we decided to gather in two of them the traditional recipients of science communication (representatives of the civil society, public administration and companies) and, in a second group, the senders (members of the scientific community including researchers, responsibles of the government of research centres and communication professionals) looking forward the participation of people with different profiles in order to enrich the debate with different perspectives. Specifically, eight participants were invited to each one of the focus groups, having 30 participants in the end. Focus groups were performed in the Universitat Jaume I de Castellón (June 9, 2015), in the headquarters Valencian Network of Universities for R+D+i (June 17, 2015), and Universidad Politécnica de Madrid (June 21 and 22, 2016). The year that passed between the first two groups and the two latter allowed to introduce in the discussion the progresses achieved by the study during that time. Two Delphi panels were carried out to validate the ethics model of communication for the development of rri suggested by the discourse ethics. The panel allowed us to progress towards consensus in conclusions from the arguments of experts, keep the anonymity of intercurrent between them and achieve a controlled feedback. Regarding experts participating in the Delphi panel, we tried to have individuals outstanding as references in the different areas related with the study such as ethics, university communication, science communication and rri, besides scientists in order to also incorporate their vision. This, panels had chair professors of Moral Philosophy, Inorganic Chemistry and Physics, with communication directors from university, fecyt representatives, researchers in the management of responsibility, members of the European Group of Experts in rri and with responsibles of European projects about rri such as rri Tools, Enrrich and heirri. The Delphi panel included an explanation of the model of communication suggested from the discourse ethics, formulating afterwards an open question about the model and its opportunities and risks. Also, evaluation questions were set forth in a 0 to 4 scale (from ‘not at all’ to ‘very much’) about the relevance of the communication for the development of a Responsible Research and Innovation and the dialogue with the stakeholders when it comes to stablish the purposes for research and innovation. Besides, the consideration of experts was requested about whether the research centres and Spanish universities consider ethics and social responsibility criteria in the management of research and innovation and in the management of research and innovation communication. Regarding the performance, we chose two rounds, so that in the second one experts could compare their previous responses with the rest collected in a report, so that after reviewing it, they could maintain their opinion or change it. Most of professionals of science communication of the Network of ucc+i know the term rri (90%) and 60.5% state that that their institution carries out actions that could be considered as rri. However, when it comes to explaining them, respondents make reference to the implantation of actions and institutional policies within the field of Corporate Social Responsibility of the University Social Responsibility. Nevertheless, the enforcement of rri is scarcely presented and sometimes as quite unspecific lines of action. In the best of cases, it is performed through very concrete projects and adjusted to the philosophy of rri. However, there are no centres showing a clear institutional line that apply these types of criteria in a transversal manner, which is also explained from the fact it is still an emerging concept. Regarding the communicative process (publics, channels and timing), surveys reflect that the society is the most important and frequent public for ucc+i in matters like science, followed by media and scientific community. The publics considered as less important and with whom they interact to a lesser extent are public administrations and business sector. The graphic shows the averages through the numeric relation 0-never and Don’t know/ Don’t answer, 1-not much, 2-somewhat, 3-much and 4-very much. Regarding communication channels for interaction, social networks and to, a lesser extent, the email, they are very used by ucc+i to know the expectations and needs of the interest groups in matters such as science and innovation, which confirms the usefulness of cit to interact with publics. Also, other routes are highlighted such as meetings with researchers, that even surpass the email. 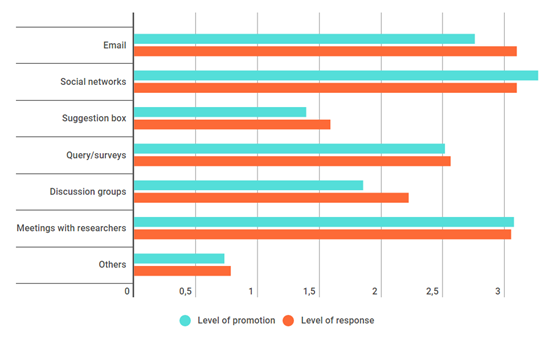 In the interaction channels with stakeholders there are imbalances between the promotion and response level. In this sense, it is worth mentioning that the two that receive more diffusion such as social networks and meetings with researchers, have an inferior level of response, being this imbalance larger in the case of social networks. On the contrary, the level of response is superior to the promotion in the rest of cases, especially in email and discussion groups, followed by the suggestions box. Regarding the application of ethics and social responsibility criteria, the respondents have an elevated perception of their application in the management of research and innovation from their institutions, stating in most cases that they are quite considered (average of 2.87 over 4). It is also elevated, although something less, the consideration that the ethics and responsibility criteria are applied to communication of science (average of de 2.82). However, in their comments, professionals of communication of science explicitly indicate the relevance of improving the implementation of ethics and responsibility criteria in research in their institutions, as well as the need to stablish a greater dialogue with the society and incorporate RRI globally in the institutions. In this sense, the role of ucc+i and of professionals of PCST in the development of rri is defended. The making of four focus groups with stakeholders and a Delphi panel with experts offered interesting reflections that contributed to know their perceptions about the current situation of communication of science. Likewise, stakeholders and experts were shown a proposal of ethical model of communication for a responsible research based on the dialogue and communication to know the expectations of the interest groups from research centres, establish public commitments to comply with them and keep accountability of achieved results. The four focus groups showed relevant points in common between the view of traditional senders of communication of science and its recipients, coinciding in a very generalized manner in aspects such as the predominance of a unidirectional view of communication of science, although some of them detecting a mild but increasing impulse of initiatives that look for the bidirectionality and the interaction with publics. From both groups, they also agreed in considering that, even though the bet of universities for scientific communication has increased, there is still a considerable deficit and it is necessary to improve it. Likewise, discussion groups confirmed the change of paradigm in communication of science since the recent apparition of cit and the crisis of traditional mass media. Regarding the communication model of rri suggested according to the discourse ethics framework, the perspective shown was practically opposed in each one of the discussion groups. While those comprised by the recipients of communication valued a greater participation and engagement in the managing of research and innovation positively, several representatives of the scientific community and the communication of science professionals showed reluctant. Likewise, it was evidenced the rupture that a communication model entails based on the proposals of the discourse ethics regarding the current way of understanding communication of science from universities. Regarding the responses suggested by experts participating in the two Delphi panels, the nine of them coincided that no ethical and social responsibility criteria are applied in the management of current research and innovation. This perception is even higher regarding the non-application of these criteria in the communication of science in universities and research centres, which contrasts with the positive perception the communication professionals of universities have about this matter as it is reflected in the comparative graphic. Consulted experts coincided mostly in outstanding the interest, opportunity and suitability of the suggested model, as well as its contribution to move forward towards a better and more efficacious communication of science from universities, considering it pertinent in its purpose and design from and ethics perspective. In this sense, they agree in considering the role of communication as very important in the development of rri and fundamental in the dialogue with other stakeholders in order to determine the purposes of research and innovation. However, they pointed out some of the risks it entails precisely due to the innovative character of the proposal and the rupture it comprises regarding inertias of the university and the research centres. The contributions made by participants in the focus groups and in the Delphi panels allowed introducing different improvements in the model suggested initially, among which there outstand the incorporation of a previous phase of proactive information for interest groups about options and possibilities that the university offers in matters of research and innovation. This and other contributions are gathered in the model presented herein. 3.2. A communication protocol proposal for RRI. In order to develop a management protocol of communication management that allows favouring rri it is necessary to stablish in a first moment a definition of rri from the ethical framework suggested. The redefinition we suggest takes the csr model of the School of Valencia as reference according to the discourse ethics and the stakeholders theory. From these suggestions, it is understood that: “The Research and Innovation will be responsible when the decisions about acceptability and desirability of the same and its results can be accepted by all present and future individuals affected and/ or involved in an open dialogue in symmetric participation conditions. The process of Responsible Research and Innovation (rri) means establishing conditions of communication, interaction and participation, by the different interest groups (stakeholders) necessary to achieve said acceptability.” (Sanahuja, 2016). The definition puts accent in the dialogue as baseline to make decisions about the acceptability and desirability of science and innovation, both regarding its processes as well as its results. In order to have a moral value, in the dialogue the present and future affected parties should participate in symmetric conditions, which introduces the need to evaluate risks and opportunities the processes of research and innovation will have later on. Communication, interaction and participation from stakeholders- concepts mentioned by authors such as Schomberg (2011, 2013), Stilgoe (2013), Sutcliffe (2011) and the eu (European Commission, 2012) in their definitions of rri – they are gathered as keys of the process needed to achieve the required acceptability. From the definition of rri suggested, we provide the following model, which tries to contribute, from the field of communication, to the development of rri. 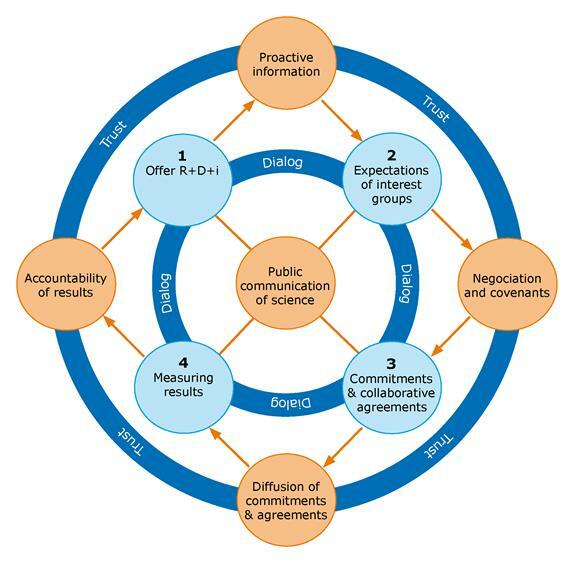 The model places public communication of science in the centre, as a process necessary to achieve objectives of the rri and, around it, there is the dialogue, that comprises all phases of the model, favouring a continuous interaction between researchers and interest group through the whole process. Around this core, constituted by the communication and the dialogue, there are established objects to be achieved in four phases, interrelated among them through communication actions: (1) make the stakeholders aware about the possibilities offered in matters of research, innovation and development. It is considered that this information is of interest when the interest groups determine their expectations. In this phase, it is necessary that researchers or the research centre show a proactive attitude when it comes to transmit information. (2) Know the interests and expectations of stakeholders, it is necessary to establish a dialogue with each one of them through the mechanisms and channels considered most suitable. Once the legitimate expectations are known, the negotiation with the interest groups allows achieving agreements, thus getting to the next phase. (3) Acquiring specific commitments by fields and publics to satisfy legitimate interests. These commitments must be made known for the public opinion through a sufficient and transparent information. (4) Evaluate the results achieved. The public information of them must comprise both achieved goals as well as objectives not fulfilled, accounting for the reasons they haven’t been complied with. The last phase doesn’t close the process, because it is a circular model where results achieved feed again the proactive information from the research centre or group regarding the options offered to their stakeholders in matters of research and innovation, therefore generating new expectations and interests. The specific communication actions stablished in the last level are understood as necessary to achieve each one of the objectives and grant them validity. The mechanisms of participation, negotiation, public communication and transparency allow to progress among the different phases of the process and reach the trust of the interest groups. In short, the communicative model suggested to contribute to rri in the universities place communication and dialogue as principle and engine of a research and innovation that can be considered responsible (García Marza et al, 2017). The model developed for a communication management that favours rri from the perspective of the discourse ethics and the model of critical understanding of science in public (cusp) leads to suggest a protocol proposal for its application in different scales, from a project or research group up to a university, institution or company developing R+D+i. The protocol looks to answer to the call made by the eu in the Declaration of Rome, where there is encouragement to create new narratives for the research and innovation, developing guidelines of action for the implementation and development of rri. Likewise, the European Commission encourages spaces of experimentation to make actors of the civil society take part in the process of research as sources of knowledge and partners for innovation (European Commission, 2014). - Public engagement (pe) or public participation. Experts in charge of elaborating the document Indicators for promoting and monitoring Responsible Research and Innovation define the pe as a social commitment in providing opportunities and competences to empower citizens so that they take part in the debates about R+i. As deeper forms of participation in science in technology, there highlight trends where citizens are peers in the processes of production, evaluation and governance of knowledge such as citizen science, spaces of creation, etc. When it comes to stablishing actions and indicators around this axis, experts distinguish between: (1) politics, regulations and normative framework; (2) creation of events and participation initiatives; and (3) development of competences, related to the training of research staff and mediators. Considering the communication protocol, indicators linked to the development of events and pe initiatives are especially relevant, among which issues such as referendum, citizen science, science and technology development by crowdfunding, social media and web 2.0 are included. - Open access / open science. According to Winfield (2014), the group distinguishes three levels of open science. Level 0 entails maintenance with frequent updates of project’s websites, access to accepted drafts, inclusion of the data with publications and publications in open access journals. Level 1, additionally incorporates blogs of projects with explanations and comments, responding to interactions and videos of the project in platforms such as YouTube. Regarding level 2, it sums to the previous actions, the incorporation to web spaces in a systematic manner, the experimental data accompanied by explanatory notes, lab daily journals accessible on real time and a regular dialogue of about the project among all individuals involved through a public access platform. The possible results indicators for open science established by experts emphasize in the vitality of repositories, blogs and other virtual environments for the exchange, social learning and social innovation. - Ethics. When it comes to elaborating indicators, experts divide ethics in the broad context of RRI into three sub-fields: (1) integrity of research and good research practices, (2) ethics of research for the protection of research objects and (3) the social relevance and the ethics acceptability of R+i results. This last one is the one centring the present protocol and, besides, it is the one the authors of the report consider closer to the general policy of rri as transversal principle, acknowledging that it is one of the criteria of rri needing new concepts and indicators design the most, aspects the present study is looking to contribute with. However, the changes documented in the priorities of R+i assignable to multiparty or transdisciplinary processes of evaluation of social relevance and ethics acceptability are pointed out as possible indicators, as well as the existence of mechanisms for the development of these processes. Considering the European framework and the communication model suggested, we establish that the protocol objectives inform about the research offer of the interest groups, therefore, it is necessary to determine them previously; know the expectations and legitimate interests of these stakeholders; establish commitments and collaborative agreements with these interest groups; account for results; and keep a participative and inclusive dialog and a proactive, transparent and open information about the research process and its results. Elaboration of the Map of Stakeholders and the creation of a contacts data base. Conference of consensus, debates, discussion groups, work groups, online/ offline consultations about interests and expectations, surveys, virtual Exchange environments, citizen science, crowdfunding,.. Considering its development, we suggest a proposal in three phases and six stages. The initial phase includes the stages of determination of stakeholders, proactive information, negotiation and covenants with the interest groups and diffusion of commitments achieved, stages that entail establishing the grounds of a research and innovation that responds to the expectations of stakeholders from the dialogue and a critical and contextual communication. The development phase is focused on actions of continuity of communication and dialogue, while the final stage comprises accountability. Each one of these stages is lined to one of the objectives established. In the following table the protocol is developed, contributing with possible actions to carry out in every stage. - Proactive and contextual information. In these kind of actions communication and diffusion mechanisms such as press release, communication in networks, blogs, webs, transmedia, informative mains, conferences, guided visits, etc. can be used. The information about research and innovation must respond, additionally, to the principles of open access. In this sense, we suggest as minimum requisite the so-called level 0 of Winfield (2014). - Critical dialogue and participation. rri as we have seen, requires the incorporation of the voices of the affected parties through an active listening, as well as a dialogue that guarantees a response. These kinds of actions can include consensus conferences, open debates, discussion groups, work teams, actions of citizen science, participative crowdfunding projects, online participation channels that favour a bidirectional relationship (blogs, networks, virtual exchange environments,..), etc. We understand that the suggested protocol adequates to the framework of discourse ethics and the normative European framework of rri, responding to some of the challenges of PCST. From an ethics perspective, it offers an orientation towards actions, decisions and politics that the university can incorporate to respond to the demands of its interest groups, locating in the field of behaviour and the social responsibility. The rri approach introduced herein is turned into a moral resource for the achievement of optimum conditions for the generation and maintenance of trust. Besides, the model complies with the principles of the cordial ethics stablished by Cortina (2007), specially the principles of non-instrumentalization of individuals, train them so that they can act in an informative and autonomous manner, and consider the interests of affected parties by the decisions through the dialogue according to the dialogic principle. In compliance with these three principles, the role of communication is fundamental. Likewise, it is linked through the discourse ethics, to the model of deliberative democracy. According to Carsten (2013), the model addresses the need of public participation as well as the accountability through communicative transparency. Regarding the European normative framework, the proposal is adjusted to it, promoting an open, inclusive dialogue and submitted to public information in the field of research and innovation, following the guidelines of the ue Treaty. Likewise, it moves forward in the three fields established by the Science and Society Action Plan, favouring the promotion of scientific education and culture when the communication of science is placed in the centre of the process; the elaboration of scientific policies closer to citizens, helping to rethink the social contact with science according to the legitimate needs and aspiration of citizens, and the incorporation of a responsible science in different policies. Likewise, it responds to some of the risks and challenges of communication between science and society suggested by experts of the masis project (Sinue et al, 2009), avoiding falling into excessively simplified models and concepts of how science and society communicate; addressing the challenge of proposing the science in society as the establishment of adequate forms for communication and dialogue; discarding the myth of a singular public adapting the communication to the different stakeholders; contributing through dialogue to break the reluctances of scientists towards society; comprising the responsibility of communicate by science and participate by the society; favouring a greater understanding about the nature of science as evolutive activity and making the collective responsibility possible in the construction of potential futures. Besides, it addresses the challenge stablished on the report that grounds the basis of rri, A report on Responsible Research & Innovation (Sutcliffe, 2011), of proposing an innovative an innovative and inclusive rri when it comes to reach effective participation of citizens in all stages of research and innovation, guaranteeing an adequate feedback. Finally, the protocol offers response to a need of a science for and with the society promoted and demanded by the European Union, impacting both the decisions about what is wanted to be done -for- as well as who shall take part -with- (Owen et al, 2012). Likewise, the protocol addresses the “golden rules” established in the practice guideline for rri (rri Tools, 2016), among which there are being open and transparent, an aspect that is “vital to generate public trust” and that includes disseminating results, methods and data; favour participation and a significant dialogue and of multiple routes with all interested parties; and establishing the grounds for accountability. Among the “golden rules” the model responds to, there is also the “respond and adapt” in the sense of changing as consequence of contributions, collecting the society’s feedback. Finally, it is worth mentioning that the protocol proposed responds to the increase social demand of participation in matters of science and technology reflected in the last Surveys on Social Perception of Science (fecyt, 2015 and 2017). In the survey published in 2015 for the first time, were a majority –a 53.1%– the citizens that considered they should perform a more relevant role in the decisions about science and technology affecting them. This perception slightly decreases although it is still the majority on the survey published in 2017 (51.6%). From the research developed we have seen how the discourse ethics constitutes a framework for rri, which offers a horizon of moral validity in its management. The reference given by the csr model of the School of Valencia allows to link the development of a more responsible research and innovation to the theory of stakeholders, so that it acts in a “responsive” manner regarding legitimate interests of affected individuals. In the discourse ethics, the moral aspect is in the dialogue and in the possibility of achieving agreements, therefore the PCST is necessary, understood as a critical and inclusive communication. Based on the definition of rri suggested, if we understand that research and innovation can be considered responsible when the decisions about acceptability and desirability of the process and its results can be accepted by all possible affected parties in an open dialogue under symmetric conditions of participation, the communication becomes an indispensable moral requirement towards reaching this acceptability. Likewise, the model of public communication of science suggested for the development of rri, finds in the PCST the principle and engine to contribute to the development of a research and innovation that can be considered responsible. The ethics communication of science is considered, therefore, as an indispensable requisite for the development of a model of Responsible Research and Innovation management. Experts, interest groups and professionals of science communication consulted using the different methodological techniques coincide in acknowledging and reinforcing the key role of communication for the development of rri. However, as reflected from the three collectives, the current PCST system mostly maintains a lineal model from science towards a passive public, informing about researches when they finish and in an unidirectional manner. Even though the information of science, with its classical structures, is still important, from the rri point of view, it should be complemented and enriched with new forms of understanding communication from interactivity and deliberation, moving towards a model of critical understanding of science in public (cusp). The digital channels and the transmedia can play a relevant role when it comes to favour this bidirectionality, even more considering that they are among the most used channels to communicate science. The consultations to experts, stakeholders and PCST professionals have evidenced how the rupture of the communication model suggested before the current dynamics, are among the main challenges the protocol must face for its implantation. Another of the challenges is about overcoming reluctances that there are still in part of the scientific community when it comes to inform groups of affected parties about the research processes, and especially in the determination of their purposes. The communication protocol for rri developed through the study looks to contribute as a practical tool of application for a change in the way science and technology communication and interact with the society and, more specifically, with its interest groups. The public participation or public engagement, open and transparent science and ethics from a discourse perspective are the axes on which the protocol pivots, establishing mechanisms to progress in anticipation, reflexivity, inclusion and response capacity with which the science and its institutions perform. *Funded Research. Funded research. Part of the results of this article are part of the project “Study about communication of Responsible Research and Innovation in UCC+i: A model proposal” funded through the Convocation for Funding for the Promotion of the Scientific, Technological Culture and Innovation of the Spanish Foundation for Science and Technology (fecyt) belonging to the Ministry of Economy and Competitiveness and developed between January 1 and December 31, 2016. - D Brossard & BV Lewenstein (2010). "A Critical Appraisal of Models of Public Understanding of Science: Using Practice to Inform Theory". En L Kahlor & PA Stout (eds. ), Communicating Science. New Agendas in Communication, pp. 11-39. New York and London: Routledge. - B Carsten Stahl (2012). Morality, Ethics, and Reflection: A Categorization of Normative IS Research. Journal of the association for information systems 13(8), 636-656. - A Cortina (1993). Ética aplicada y democracia radical. Madrid: Tecnos. - A Cortina, J Conill & D García Marzá (2005). Ética de la empresa. Claves para una nueva cultura empresarial. Madrid: Trotta. - A Cortina (2007). Ética de la razón cordial. Educar en la ciudadanía en el siglo XXI. Oviedo: Ediciones Nobel. - European Commission (2000). Ciencia, sociedad y ciudadanos en Europa. Documento de trabajo de los servicios de la Comisión. Bruselas. - European Commission (2002). Science and Society Action Plan. European Research Area. Bruselas. - European Commission (2012). Responsible Research and Innovation. Europe’s ability to respond to societal challenges. Bruselas: Publicaciones Oficiales UE. - European Commission (2013), van den Hoven, J., Jacob, K., Options for strengthening Responsible Research and Innovation — Report of the Expert Group on the State of Art in Europe on Responsible Research and Innovation, DG Research and Innovation. - European Commission (2014), Rome Declaration on Responsible Research and Innovation in Europe. - European Commission (2015), Chair: Roger Strand, Rapporteur: Jack Spaapen, Members: Martin W Bauer, Ela Hogan, Gema Revuelta, Sigrid Stagl. Indicators for promoting and monitoring Responsible Research and Innovation. Luxembourg: Publications Office of the European Union, 2015. - FECYT (2015). VII Encuesta de Percepción Social de la Ciencia y la Tecnología. Madrid: Fundación Española para la Ciencia y la Tecnología. - FECYT (2016), UCC+i Origen y evolución (2007-2014). Fundación Española para la Ciencia y la Tecnología, Madrid. - FECYT (2017). VII Encuesta de Percepción Social de la Ciencia y la Tecnología. Madrid: Fundación Española para la Ciencia y la Tecnología. - F Fernandez Beltrán, F. (2008). Las memorias de la RSC, una comunicación tangible en la gestión de los intangibles. Ponencia realizada en el Curso de Verano “La elaboración de memorias de RSE: un instrumento para el diálogo empresarial”, Benicàssim (Castellón): Universitat Jaume I. - RE Freeman (19 Strategic Management. A Stakeholder Approach. Toronto: Pitman. - D García Marzá (1992). Ética de la justicia. J. Habermas y la ética discursiva. Madrid: Tecnos. - D García Marzá (2006). La responsabilidad social de la empresa: una definición desde la ética empresarial. Revista Valenciana de Economía y Hacienda, nº12, III, pp.77-94. - J Habermas (1998). Facticidad y Validez. Madrid: Trotta. - M Horst (2008). "In search of dialogue: staging science communication in consensus conferences". En Cheng, D.; Claessens, M.; Gascoigne, T.; Metcalfe, J.; Schiele, B. y Shi, S. (eds. ), Communicating Science in Social Contexts. New models, new practices, pp. 259-274. Brussels: Springer. - JD Miller, R Pardo & F Niwa (2001). Percepciones del Público ante la Ciencia y la Tecnología. Madrid: Fundación BBV. - R Owen, P Macnaghten & J Stilgoe (2012). Responsible research and innovation: From science in society to science for society, with society. Science and Public Policy 39 (6): 751-760. - R Sanahuja (2016). Aspectos éticos de la comunicación de la Investigación e Innovación Responsables (RRI) en la universidad. (Tesis doctoral). Castellón: Universitat Jaume I. - VE Scholten van der Duin (2015). ‘Responsible innovation among academic spin-offs: how responsible practices help developing absorpive capacity’. Journal on Chain and Network Science 15 (2), pp. 165–179. DOI: 10.3920/JCNS2015.x005. - V Scholten, J van den Hoven, E Cuppen & S Flipse (2016). “Science communication and Responsible Research and Innovation. How can they complement each other?” JCOM 15 (06), C04. - RV Schomberg (2011). Prospects for technology assessment in a framework of responsible research and innovation. Technikfolgen abschätzen lehren. R. Beecroft (Ed.). Dusseldorp: Methoden. - RV Schomberg (2013). A vision of responsible innovation. Responsible Innovation. R. Owen, M. Heintz y J. Bessant (Eds.). Londres: John Wiley Forthcoming Books. - J Stilgoe, R Owen & P Macnaght (2013). Developing a framework for responsible innovation. Research Policy. 42, 1568– 1580. - J Stilgoe, SJ Lock & J y Wilsdon (2014). ¿Por qué debemos promover el compromiso público con la ciencia? Comprensión Pública de la Ciencia. 23: 4. - AF Winfield (2014), ‘Open science —a three level approach’. Presentation at the conference Science, Innovation and Society— Responsible Research and Innovation, Rome, 20 November. Article received on 19 June 2017. Accepted on 17 September.